I've been a fan of drummer Jerry Granelli since I stumbled upon News from the Streets in the mid 90's. The double electric guitar line up and organic pulse of the music just bowled me over at the time. 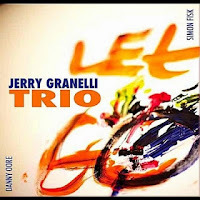 Over the ensuing years, Granelli's output has been consistently interesting and unique, like with the V16 group featuring electric slide guitarist David Tronzo, and he continues his high quality offerings with the recent trio recording Let Go, an acoustic outing that is quite an expressive and evocative endeavor. I'll admit though that it took a few listens for its more subtle nature to grab my attention. It was during Danny Oore's soprano solo on 'A Chinese Saloon' that my attention was suddenly seized. With Granelli's drums accentuating off beats and creating dramtic dynamics below the lyrical woodwind, I started listening more attentively. The trio's sound and melodic ideas are refined and exciting, hardly using volume as a critical dynamic, the music streams effortless from each musician. They can play it rather straight ahead, like the bluesy figure like on 'A Woman Who Wants to Waltz', as well as more esoterically like on 'Letter to Bjork'. On the latter, percussive clatters spark up against a repetitive melody bowed on the bass while other tones chatter like insects in the background. 'Leaving 1313' is another tune with a subtle pocket and the opening 'Bones' features some grittier sax playing and loose but structured passages and with some free playing. Though the trio is ostensibly woodwind, drums and bass, Simon Fisk doubles up on cello and Canadian singer Mary Jane Lamond is featured on a couple tracks. The vocal tunes are sung in Gaelic and while lyrically lost to me, are rhythmically and melodically endearing. let go of what you want it to be. let go of how you think it to should be. even let go of your vision. and so we began by bringing in compositions and tearing them apart to find out what worked. This recording is a crystallization of that process. This album is one to let yourself go in, it's smart and satisfying, and contains an subtle energy that intensifies with each listen.